A new toner seems like something I'm always in the market for - same with a facial cleanser, but that's a story for another day... 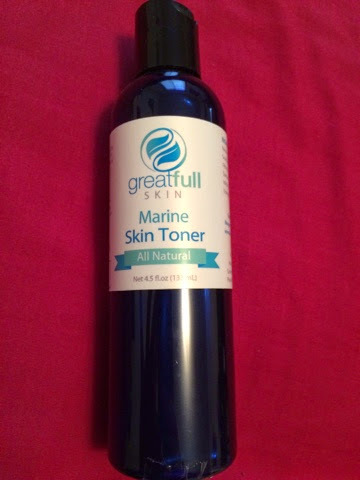 I was so excited when GreatFull Skin offered me the chance to try their new Marine Toner and give you all my thoughts on the product. Because new items introduced to any skincare routine can take 30 to 90 days to show it's full effect, my plan with this review is to give you my first impressions on the product I've used and any effects I received within 30 days of using the products mentioned here. This Marine Toner is a balancing toner for all skin types, but claims to be especially helpful for acne prone skin by clearing out clogged pores and blackheads. This toner is alcohol free (which is great, because alcohol actually causes more acne in my skin), and contains sea kelp bioferment which naturally nourishes and regenerates your skin. 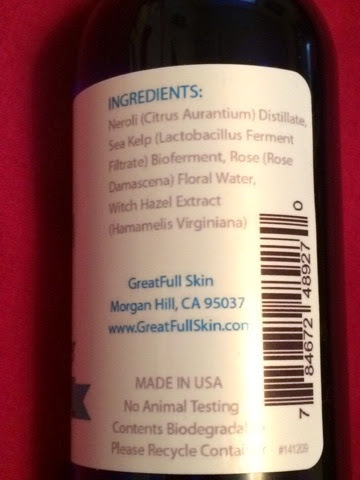 I'm a big fan of fermented skincare ingredients, which I often talk about on my beauty blog - so to see a fermented ingredient in this toner really made me literally jump for joy. This toner contains only 4 ingredients, none of which pose to be an irritant for sensitive skin or a trigger for acne - perfect! This toner has a pH of 5, which really isn't acidic enough to exfoliate, but may still help in the gentle removal of dead skin cells. A pH of 5 does however mean that it will keep your skins pH low enough to protect your skins natural moisture barrier and, in my case, prevent acne outbreaks. I do get the occasional small whitehead here and there, but I no longer experience cystic acne. This is a nice, effective toner - with a nice natural scent that works well at preventing acne and treating clogged pores. If you would like to try it for yourself, you can pick it up on Amazon. Disclaimer: Baby and the Chi's blog received the product(s) mentioned in this post for the purpose of review and evaluation. No monetary compensation was received for this post. Baby and the Chi's blog will always provide honest opinions, beliefs or experiences on products reviewed. If you have any questions, please contact me at babyandthechis at gmail dot com. This blog contains affiliate links. Baby and the Chi's is not responsible for prize delivery. The disclosure is done in accordance with the Federal Trade Commission 10 CFR, Part 255 Guides Concerning the use of Endorsements and Testimonials in Advertising.